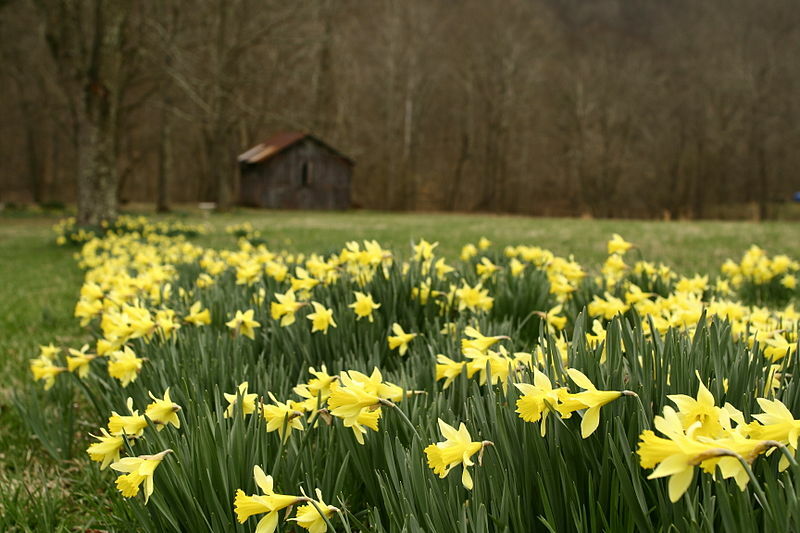 Although it may not feel like it in many places, it is now officially spring in the United States. Despite the below freezing temperatures in much of the country this past weekend, we can expect warming weather and blooming flowers in the near future. But just how far away are those flowers? In contrast to the freezing weather this year, large parts of the country were already well on their way to spring at the end of March last year. While the aphorism goes “April showers bring May flowers,” it may be that the flowers are ahead of schedule. Increasingly early bloom times are one of the most visible indicators of climate change. Work in New England, based on the records that Thoreau kept during his time at Walden pond, indicate that bloom times have moved up by as much as six weeks – from mid-May to April 1st. Records kept on the timing of cherry tree blossoms in Kyoto Japan stretch back more than 1200 years and show a distinct trend towards earlier blooms beginning around 1900. And in 2012, well over half of the vegetation in New England, the Mid-West and Mid-Atlantic bloomed early; in many cases by as much as 36 days. Why does this matter? First, birds and insects time their life-cycles to the blooming of plants. In the case of birds, many may be returning north on migrations that coincide with the height of blooms in order to take advantage of food sources. Insects may time their hatching for similar reasons. Disruptions in the blooming time can therefore cause major disruptions in the migrations or hatching of birds and insects. While evidence suggests that birds and insects have adjusted their behavior alongside the changing bloom times, if blooms continue to happen earlier it is unclear if migrations or hatching will keep pace. A more anthropocentric concern is the effect on crops. While bloom times have moved earlier – a response to higher average temperatures – the variability around temperature has increased as well. This means that the probability of a frost event striking after plants have bloomed has increased. These types of events can be devastating to farmers as they can eliminate an entire season’s crops by killing the newly budded flowers. Thus, as bloom times move earlier at the same time temperature variability increases, the risk of lost crops – and the corresponding increase in food prices – increases. Further, the possibility exists that food prices could increase even without a major frost events. Most farmers carry insurance on their crops. Typically insurance is priced based on the value of the insured property (or crop) and the probability that the property will be lost. If the probability of frost events increases – even if they never happen – you could easily see increased insurance premiums translate into increased food costs. So as this particularly frigid winter warms into spring, even if it is a late spring this year, note when those first flowers appear. This year they may come in May as predicted. But should they sprout up earlier let them serve as a reminder that climate change’s impacts are not abstract and confined to melting ice on far away continents, but directly affect ecosystems everywhere.